UDM Downloads > Bar Code Labels Maker! Download bar code labels maker tool which enables you to create barcode labels of any size and colour and save created result into commonly used file formats such as BMP, JPEG and GIF. Free barcode maker utility is reliable in generating high resolution bar code image labels and provides you the options to use several customizable modes, which provide facility to change the Caption colour, Caption font, Barcode colour, Background colour and Barcode size of the created barcode labels. Barcode coupon creator program can support almost barcode font standards such as Code 11, Code 39, Code 93, POSTNET, Codabar, UPCE, UPCA, PLANET UCC128, CODE128, EAN13, EAN8, IND25, Interleaved 2of5 and MSI PLESSEY etc. 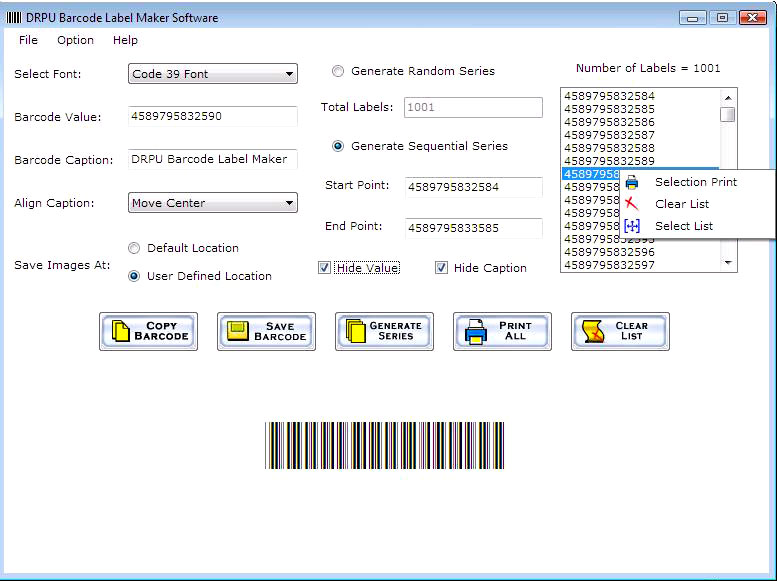 Barcode image generator and labeling software can build barcodes for several manufacturing products like identification cards, CD-ROM label, video tape label, name badge, price marking etc. Barcode generation tool creates high resolution barcodes and print it by using barcode printer or normal printers. Utility have no restriction over the number of barcodes quantity, it can create infinite numbers of images simultaneously. Barcode generator software supports all windows based operating system with easy and convenient manner. Features: *Barcode image generator utility can create several 2D barcode images simultaneously. *User can alter various changes in its size and shapes by using various customizable options available in software. *Created result can be saved in several popular image file formats. *Bar code label maker tool supports all font standards and can easily print barcodes by using normal printers. *Software is highly interactive, so that technical as well as non technical users can easily operate it.